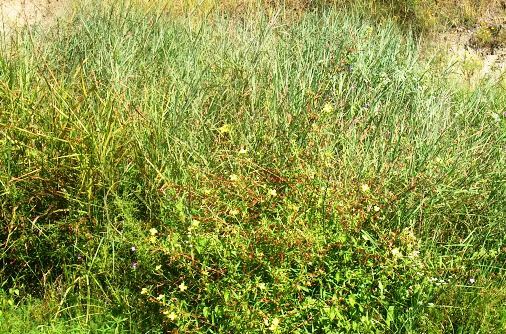 Emergent plants grow above the water in shallow areas of ponds, lakes, rivers, and irrigation ditches. They are generally rigid, and are not dependent on water for support. 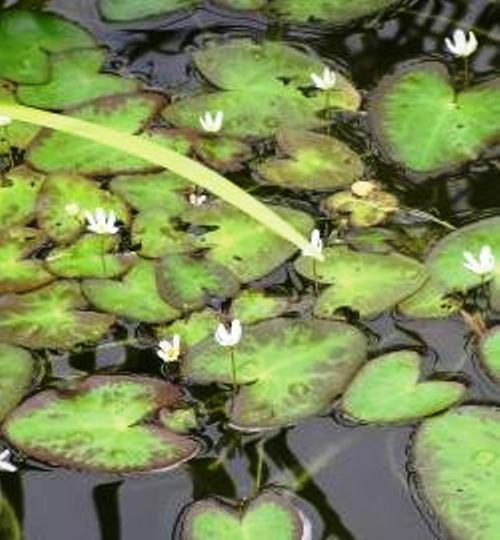 Many are not a true aquatic plant, but can survive in saturated soils, or submerged for a long period of time. 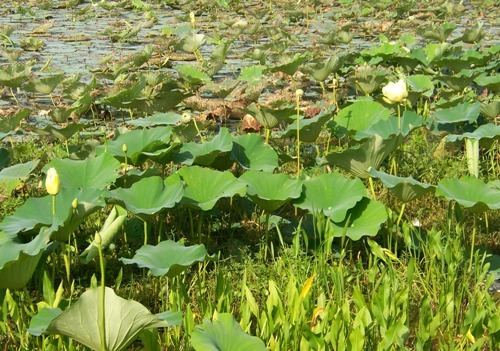 American Lotus: Floating leaves are circular with stems attached to the center of the leaf underside. Flowers are solitary pale yellow and are made up of numerous petals. Floating Heart or Banana Lily: Banana lily is a perennial plant with leaves that arise from “banana-shaped” rhizomes on the long slender petioles. The floating leaves are 2 to 6 inches in diameter, kidney to heart-shaped, yellowish-green above and reddish-purple underneath, with obvious veins. Flowers are small, white, in clusters on short stalks that rise above the water’s surface. The fruits are capsule-like and contain many seeds. Late in the growing season clusters of fleshy, tuber-like roots form below the flowers. Spatterdock or Cow Lily: Spatterdock is a perennial plant with leaves that arise from a large spongy rhizome. The leaves have a slit that makes them roughly heart-shaped, 8 to 16 inches long by 10 inches wide, and can float on the surface or stand above the surface on thick round (in cross section) stalks. Flowers are spiracle with 6 to 9 green sepals and yellow petals. Flowers can float on the water or stand above it. Fruits are oval with a flat top and greenish or yellowish in color. 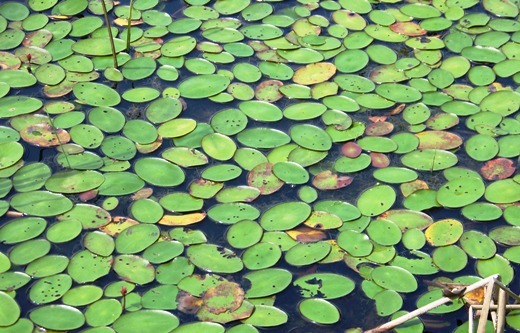 Spatterdock can spread from seeds or the rhizomes. White Water Lily: The white water lily is a perennial plant that often form dense colonies. The leaves arise on flexible stalks from large thick rhizomes. The leaves are more round than heart-shaped, bright green, 6 to 12 inches in diameter with the slit about 1/3 the length of the leaf. Leaves usually float on the water’s surface. Flowers arise on separate stalks, have brilliant white petals (25 or more per flower) with yellow centers. The flowers may float or stick above the water and each opens in the morning and closes in the afternoon. The flowers are very fragrant. 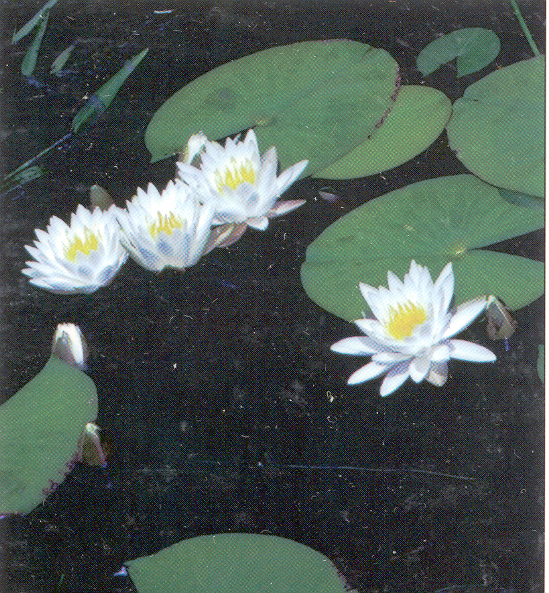 White water lily can spread from seeds or the rhizomes. Water Shield or Dollar Bonnet: Water shield is a perennial plant with relatively small, floating oval to elliptical leaves (to 5 inches in diameter) with no slit. Water shield has a distinctive gelatinous slime on the underside of the leaves and coating the stems. Leaves are green above while the underside of leaves and stems are reddish-purple. Stems attach at the center of the leaves. Flowers are small (9 1/2 to 3/4 inch), rise above the surface, are dull-reddish in color and consist of 3 to 4 sepals and petals. Water shield tends to be found in soft, acidic waters and can form large colonies.